The Mercedes GL is the biggest truck in Mercedes’s lineup. It’s the car you buy when you need seven seats but prefer reserved German luxury to Range Rover’s rugged look. What do you need to know before you buy a Mercedes GL? Don’t worry, we’ll tell you everything right here in our Buyer’s Guide. The Mercedes GL is the brute in the Mercedes stable. It weighs 5,500 pounds, sits 8.5 inches off the pavement, and stands 202 inches in length, 73 inches in height, and 84 inches in width. Like most Mercedes’s, the GL is a Best Buy on wheels. The list of gadgets and luxury features is staggering. There’s AIRMATIC air suspension, adaptive damping, ACTIVE CURVE SYSTEM (which varies stabilizer bar roll stiffness with hydraulic actuators), ATTENTION ASSIST (which prevents drivers from falling asleep), Active Lane Keeping Assist (which uses brakes to keep the vehicle moving between the lines), DISTRONIC PLUS adaptive cruise control, COLLISION PREVENTION ASSIST (which warns of an upcoming collision and helps the vehicle come to a halt), Crosswind Stabilization (keeps the car moving straight in high winds), Surround View 360 degree vehicle view, heated and ventilated seats, seven-inch COMAND infotainment system with Harman Kardon surround sound, and, of course, a smorgasbord of available interior trims and fabrics. We once called the GL “As Big As A German Castle.” But it may be as luxurious as one, too. It’s a fortress on wheels that will isolate you and your six other passengers from any noise, vibration and or harshness that this cruel world throws at you. The second generation X166 Mercedes GL debuted for the 2013 model year with new looks, a fresh interior, more gadgets and stronger, thriftier engines than the outgoing GL. 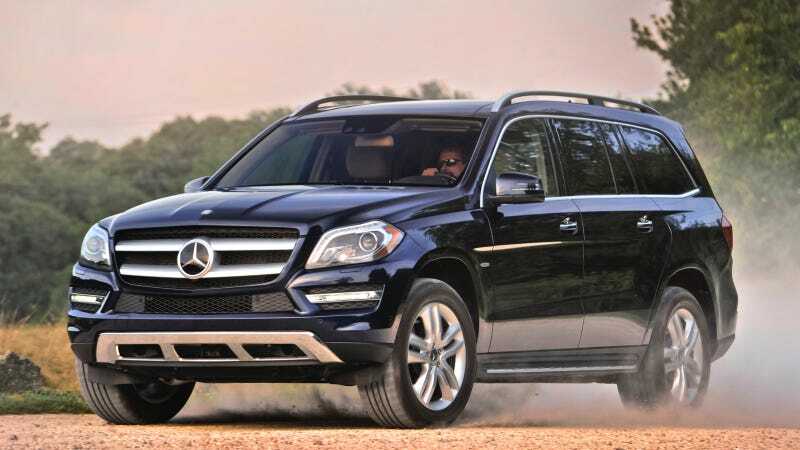 Replacing the old GL350 BlueTEC’s 210 horsepower 3.0-liter diesel is a more powerful, 240-horse 3.0-liter turbodiesel. The 335 horsepower 4.6-liter V8 in the GL450 got a bump in power to 362 horses, and the 382 horsepower 5.5-liter V8 in the GL550 was swapped for a more powerful version of the 4.6-liter making 429 horsepower. In addition, a 5.5-liter turbo V8-powered AMG GL63 made a bow for 2013. Since 2013, the GL has only seen one major change. Namely, in 2015, the GL450’s 4.6-liter V8 was swapped for a more efficient turbo V6 making the same 362 horsepower. In addition, stop/start was added to all trims sans the diesel. The Mercedes GL comes in four trim levels: GL350 BlueTEC, GL450 4MATIC, GL550 4MATIC and AMG GL63. All models get a seven-speed automatic transmission with paddle shifters, all-wheel drive (with available two-speed transfer case), electric power steering (GL63 gets an AMG-tuned speed-sensitive setup), a double wishbone front suspension, a multilink rear setup. Brakes are 13.8-inch rotors in the front and 13-inchers out back on non-AMG models. The AMG GL63 gets massive 15.3-inch saucers in the front clamped by six-piston calipers and 13.6-inch plates in the back clamped by floating four-piston calipers. We haven’t driven the GL yet, but looking at the configurator, our heart wants the 550 horsepower $122,025 AMG GL63, but our mind wants the diesel GL350 BlueTEC, which comes with standard equipment like: AIRMATIC air suspension, 19-inch alloy wheels, power sunroof, LED daytime running lights, wood interior trim, power liftgate, dual-zone automatic climate control, heated power front seats, MB-Tex vinyl upholstery, power-folding third row seats, 4.5-inch instrument cluster display, COMAND infotainment system with seven-inch display and controller, and in-dash DVD/CD player. We might tick the “ACTIVE CURVE SYSTEM” box, as it adds adaptive damping and variable front and rear sway bars to help with handling. All in with destination, the seven-passenger GL350 BlueTEC stickers at $65,475. You could get a fully decked out Audi Q7 for that money. But then, if you’re looking at a GL, that three pointed star at the front probably has value of its own.